There are many areas where you can volunteer. Click on the Volunteer title below to find out more and decide what may appeal to you. Volunteers must be over the age of 16, there is no upper age limit. We would ask that you are able to commit a few hours a week or fortnight for a minimum of 6 months. Many volunteers arrange a regular day or time, and we also work on a rota system, so we can be flexible to accommodate. Some of our volunteers like variety and wish to volunteer in a few areas within the Friends and around the hospital. So one day you could be working in the hospital shop, and the next, serving teas and coffees on the wards. All Volunteers have to provide immunisation records from their GP, have occupational health and DBS clearance before starting to volunteer for The Royal United Hospitals, to ensure the safety and well being of both volunteers and patients. Our volunteers all say how rewarding the experience is and the free tea or coffee in the Friends Coffee Shop after their duty is a great way to meet new friends. If you are interested in volunteering please complete the Volunteer Sign Up Form or contact the Friends Office for an informal chat on 01225 824046, Monday – Thursday 9am – 5pm or Friday 9am – 4.30pm. Volunteers help on the wards serving drinks to patients and providing a listening ear. By having time to give, it can make a big difference to a patient’s stay in hospital. It is a great way to help to the staff, and a smiling face is is particularly appreciated. We need volunteers who are caring and have the ability to work with people. Volunteers are needed 7 days a week mornings and afternoons for a couple of hours from either 9.30am or 2.30pm. The ‘Friends of the RUH’ realise how important it is for patients to eat their meals so that they receive the nutrients they need to aid recovery. 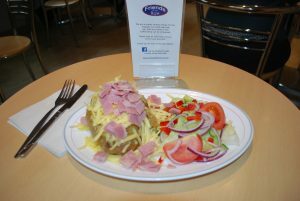 On a ward there may be several patients who need help at meal times. Volunteers assist patients on a one-to-one basis and we currently have a small team doing this. These people provide support by cutting up food and encouraging patients to eat as well as feeding them if necessary. Training is held at various times of the year. You are assessed for suitability and then newcomers work with an experienced volunteer for the first few weeks. The training lasts for two 3-hour sessions and includes role play. Feeding can be very rewarding and this role calls for caring and patient individuals. The Friends Coffee shop is a much needed space to sit, relax and enjoy a cup of coffee and light refreshment or lunch, there is also an outside terrace for the warmer months. The profit earned by the Coffee Shop is reinvested back in to the hospital to pay for patient comforts and equipment needed around the hospital. Volunteers work in teams of three or four, committing on average around three hours a week. 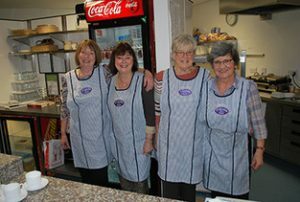 The roles involve serving behind the counter, operating a touch screen till, handling cash, clearing tables and operating the dishwasher, or perhaps in the kitchen preparing food. Volunteers are much needed at various times during Monday to Friday, 9.30am-4pm. A Carer is anyone who cares for a friend or family member, who due to illness, disability, a mental health problem or an addiction cannot cope without their support. Many thousands of carers pass through the Hospital each week, and don’t recognise that they are carers and can obtain some information, advice and services which will help to ease their situation. It is widely recognised that supporting carers helps to reduce hospital admissions and enables carers to continuing caring for longer. By supporting the carer, we can not only help reduce the likelihood of the person they are caring for being readmitted, but also improve the wellbeing, financial situation and long term health of the carer. You will be fully trained to help identify carers and offer them information and referral to Carer Centres. This is an active, involved role for which you will need to be comfortable approaching people. 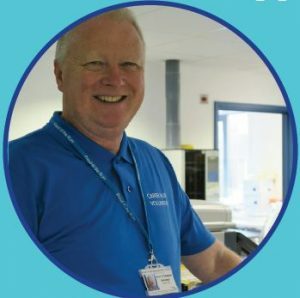 The shifts on the ward are from 2pm until 4pm, alternatively you can volunteer in the morning from 10am until 12noon, where you will either visit the outpatient departments or remain in the Hub engaging with visitors and patients. Our patients, visitors and staff really appreciate being able to buy necessities while they are in hospital. The shop also raises a great deal of money towards paying for patient equipment and amenities. 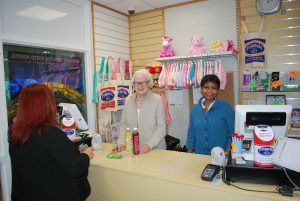 The Friends Hospital Shop is open seven days a week, providing a vital service for patients, visitors and staff. We sell various items including toiletries, newspapers, magazines, cards, gifts, fruit, clothing, groceries, stationary, drinks and confectionery. This is a busy and friendly environment. Volunteers work behind the tills serving customers using a scanner and touch screen till. Volunteers also help us to keep our shelves fully stocked. Volunteers typically work for a three-hour shift, it is a great way to meet new people. So whether you like an early start at 7.30am or prefer an afternoon shift, we can work with you to find a suitable shift to suit both you and the shop. 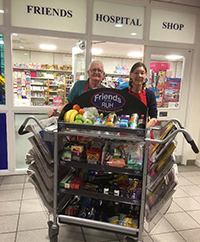 Our new Shop Trolley run by volunteers fondly known as ‘Trolley Vollies’, is a great success and has been gratefully received by both patients and staff. The ‘mini shop’ is provided by our Friends Shop and carries a selection of newspapers, magazines, drinks, snacks and toiletries which are taken around the wards for patients to purchase. We also have a touch screen tablet and scanner on board the trolley. An excellent and appreciated service for those who are unable to leave the ward. The shop trolley goes out in the mornings 9am-12pm and 1.30-3.30pm in the afternoons. Working in pairs you would visit the wards and help patients with their purchases. From June 2014 the management of Maternity Services returned to the RUH from Great Western Hospitals. As a result the Friends of the RUH welcomed 30 volunteers who help out in the maternity ward. The team of volunteers help in many ways. There are two distinct roles on the ward; meeting and greeting and breast feeding support. Meet and greet volunteers help on reception, serve drinks to patients and provide a listening ear. The breast feeding support workers give important advice and support to new mums during their stay. The many gardens and courtyards around the hospital offer patients a quiet and pleasant space. Volunteers help to maintain these with practical tasks, such as mowing, watering, putting in bedding plants, keeping gardens free of litter, pruning and the usual garden chores. The times are very flexible so if you enjoy the outdoors, the gardening team could be for you. Volunteers help in various ways in the Emergency Department, giving directions to people as they come in – providing a drink to patients waiting, or listening quietly to those who need to talk. This can be a busy department and we need people who are calm and sensitive. Volunteers help for a couple of hours a week serving drinks to patients on the clinic and having a chat. It can be quite a nervous time waiting for an eye examination or procedure, so having a friendly person to talk to and take your mind off things, can be a welcome distraction. 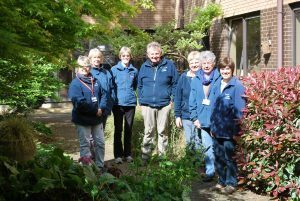 We have a team of volunteers helping as guides throughout the Hospital, who are on duty in two shifts mornings and afternoons. The guides meet and greet patients and relatives at the main entrance. In such a large complex as the Royal United Hospital it is easy to become lost, and guides will help people find where they need to go. The guides are readily recognised by their official blue shirt or sash, so you can find them easily. You do not need any specific skills except a friendly manner – though a good sense of direction always helps! Our team of knitters-at-home make items such as bed jackets, blankets and socks for the elderly patients, which is especially appreciated on cold winter days. The Friends Office can provide knitting patterns. The hospital uses hand-held devices, with questions for patients to answer regarding the quality of care they receive in hospital. Volunteers are needed to take these devices around to patients and to ask them questions and enter the details on the touch screen pad. Training will be given in how to use them and they really are easy to use. By asking patients to share their experience it gives volunteers the opportunity to really talk to patients and engage with them as well as providing valuable information for the hospital to improve the level of patient care. Volunteers serve drinks to patients receiving chemotherapy and radiotherapy and will listen if patients or their relatives want to talk. These Volunteers help fix hearing aids in the audiology department and without this they may have to be sent away to be fixed which increases the waiting time. Many of our volunteers help out at our fundraising events, such as our annual Summer Fete. We also hold a winter raffle where we raise over £2500. So if you are interested in learning fundraising skills please get involved. Or if you enjoy a fun day out please support us and come along. If you enjoy event planning then why not hold your own event such as a cake sale, or run the bath half Marathon for us. Let your imagination run wild! Monday – Thursday 9am – 5pm or Friday 9am – 12.30pm.